The GGP and Population Europe were proud to organise a Stakeholder Seminar The future of the generations to come: Youth, Work-Life-Balance and Solidarity in Europe at the European Parliament on 23 January 2018. An detailed Event Review, prepared by Population Europe and GGP teams, is available on Population Europe’s website. 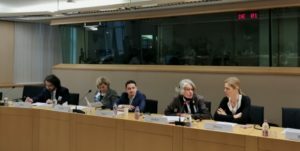 This event, with 50 representatives from public policy, civil society and the research community in attendance, was hosted by Alessia Mosca, Brando Benifei and Emilian Pavel, Members of the European Parliament.